NAMED A BEST BOOK OF 2018 BY NPR AND THE NEW YORK TIMES A PBS NEWSHOUR-NEW YORK TIMES BOOK CLUB PICK "Somehow Casey Gerald has pulled off the most urgently political, most deeply personal, and most engagingly spiritual statement of our time by just looking outside his window and inside himself. Extraordinary." - Marlon James "Staccato prose and peripatetic storytelling combine the cadences of the Bible with an urgency reminiscent of James Baldwin in this powerfully emotional memoir." - BookPage The testament of a boy and a generation who came of age as the world came apart--a generation searching for a new way to live. The testament of a boy and a generation who came of age as the world came apart--a generation searching for a new way to live. Casey Gerald comes to our fractured times as a uniquely visionary witness whose life has spanned seemingly unbridgeable divides. His story begins at the end of the world: Dallas, New Year's Eve 1999, when he gathers with the congregation of his grandfather's black evangelical church to see which of them will be carried off. His beautiful, fragile mother disappears frequently and mysteriously; for a brief idyll, he and his sister live like Boxcar Children on her disability checks. When Casey--following in the footsteps of his father, a gridiron legend who literally broke his back for the team--is recruited to play football at Yale, he enters a world he's never dreamed of, the anteroom to secret societies and success on Wall Street, in Washington, and beyond. But even as he attains the inner sanctums of power, Casey sees how the world crushes those who live at its margins. He sees how the elite perpetuate the salvation stories that keep others from rising. And he sees, most painfully, how his own ascension is part of the scheme. There Will Be No Miracles Here has the arc of a classic rags-to-riches tale, but it stands the American Dream narrative on its head. If to live as we are is destroying us, it asks, what would it mean to truly live? Intense, incantatory, shot through with sly humor and quiet fury, There Will Be No Miracles Here inspires us to question--even shatter--and reimagine our most cherished myths. 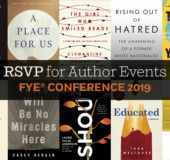 Register for the 2019 Penguin Random House First-Year Experience® Conference Author Events!